I wasn't really wanting to see this one, but my mom wanted to see it, so I went with her. She enjoyed it more than I did. Most of the movie deals with Marmaduke - a large Great Dane - adjusting after his owners move to California. The dog park he spends time at is compared to high school and there are cliques of dogs. He gets bullied by the dog leading the pedigree group and then he tries to act different to fit in more. When he manages to do that, he turns his back on the dogs who accepted him from the beginning. There are also issues with the family since Phil is so wrapped up in his new job that he basically ignores everyone. This is a movie with real people and real dogs. Effects are used to make the animals look like they are talking. The mouth movements sort of work, though they look off at times. The animals talk to each other and Marmaduke even addresses the audience, but the human characters can't hear the animals talk. I have seen the Marmaduke comic strip, but not that often, so really all I know is that it is about a large dog. The plot for the movie is very simple and predictable. A character attempting to fit in at a new place is nothing new, though it is slightly different to apply that to dogs. Most of the attempts at humor fail to be funny. There fart jokes and some other gross humor that isn't funny. A few silly moments with the dogs are slightly funny and that is about it. Too often, Marmaduke will do something wrong and then Phil or Debbie will stand there and say his name is an exasperated way and that is supposed to be funny. It isn't. At all. It gets really old, really quick. Some of the dogs end up in danger and that bugs me. I know it is just a movie, but I don't find animals in danger entertaining. Also, Phil comes across as a huge jerk. His way of dealing with Marmaduke is just to yell at him instead of actually trying to train him for the longest time. He only puts the effort out for that when it impacts his job. His treatment of Marmaduke really annoys me and I can't stand the character. None of the characters are that interesting, though some of the dogs are cute. The voices for the animals are fine, though Owen Wilson's voice really doesn't fit such a large dog. There is very little that is entertaining in this movie and I have no plans to watch it every again. I did post a longer review at Epinions a few days ago. Did you laugh politely or just sulk? I'd have sulked! Dennis the Menace? Is that the one that was turned into a film? 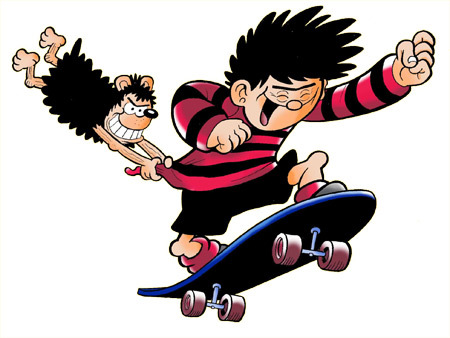 See, we have our own Dennis the Menace in The Beano! Much better. Dennis the Menace? Is that the one that was turned into a film? Well...I didn't laugh much. Just a couple of times. I might have sort of been sulking other times. I do know I kept trying to check my watch and the time seemed to creep. I remember when I first saw the trailer for this in the cinema. When it finished playing my friend and I just sort of looked at each other as if 'Did that ACTUALLY just happen?'. It looked so bad that we couldn't believe it was a trailer for a real film. Unfortunately it is a real movie. Not sure why you remember it that way. First there was Dennis the Menace (1993), with the great Walter Matthau in it as Mr. Wilson and Christopher Lloyd as the bad guy, and then there was Dennis the Menace Strikes Again! (1998) and then A Dennis the Menace Christmas (2007) (the latter two direct to video sequels). I am not aware of there being two Dennis the Menace films at the same time. I don't remember 2 Dennis the Menance movies out at the same time either. I didn't know there was a dark haired version. Rereading her comment with your comment in mind, that makes entirely sense. I also have never heard of/seen that dark-haired variation.